As Give One Get One donor, I was disappointed not to get an alternate power source for my XO laptop from OLPC, but I can understand its absence. In North America individual donors already have reliable grid power - other laptop battery chargers are not needed. 8 in one anti-electrocution and tangle-free XO power supply to be used in the classroom to improve safety, convenience and battery life. I really like this design as it allows several kids to use one outlet, an efficient use of scarce plugs, and requires they sit in clusters, which promotes collaboration more than rows of desks. Still, the XOctoPlug has the grid power limitation that limits its use in the developing world. There, even OLPC has experienced shocking electric power costs, and off-grid power is the norm. The original hand crank charger for the XO laptop was a good, if flawed idea. The torque of a hand crank on a laptop would be too much for even the OLPC's rugged design. Enter FreePlay Energy, the inventors of the wind-up radio and the robust Weza foot crank power. 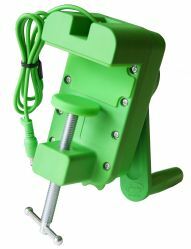 They took the OLPC hand crank idea and bolted it to a desk and called it the Clamp Charger. Freeplay claims that cranking the spur gear transmission driving a 3-phase alternator with 3-phase rectification at 130-140 rpm will yield a nominal 15VDC 1500mA output. In addition, it can be cranked in either direction. Quite an achievement, eh? I wonder if you can combine both the XOctoPlug and the Clamp Charger for an off-grid experience for a gang of students? Or connect the Clamp Charger to a bicycle for a more efficient generator rotation? Actually I find it quite funny I see this article today. The restaurant my clients and I just ate lunch at seats everyone at early 20th century sewing treadle tables with all the gearing,wheel and pedal cranks still attached. I would seem a pretty easy thing to mass produce in cast-iron tool loving China(this isn't a dig, take a trip to Northern Tool or Harbor Freight sometime if your in the US) and *EASILY* adaptable to the clamp charger above(lose the crank handle add a pulley wheel) and suddenly you have a hands free charger that can be stacked next to each other quite easily..I seem to recall early OLPC postings about this back with was still showering us will all his glorious "big picture" ideas but I have not seen much as of lately. On the other had you could do the same thing with those Indian TaxiCab Fiat alternators too. Those treadle-powered sewing machines are still made, in limited quantities, for Amish consumers. I live not-especially-far from Lancaster County, PA, where there is a thriving Amish community as well as several "tour an Amish farm" attractions. One of the appliances in the electricity-free houses is often a human-powered sewing machine. According to the tour guides, there is at least one manufacturer who produces a small number of these machines for the Amish customer base. If the demand for treadle-powered devices were to suddenly increase, in order to satisfy the needs of people who'd like to use them to charge batteries, I'm sure the manufacturers who are already producing the devices won't mind a bit. (This is an automatically generated response.) Thank you for your interest in Freeplay's charger for the OLPC XO. It is not currently available for individual sale, but when we have more information about availability, we will let you know. We've made note of your email address so that we can contact you. Thank you. My housemate has a solar company and potential designs to accompany the XO, if there is interest. The XOcotPlug isn't just a concept - there are working prototypes. I designed the XOctoPlug prototype in collaboration with Carla. Take a look at http://wiki.laptop.org/go/Peripherals/XOctoPlug#Prototype for some images. Do you know when the XOctoPlug will move from prototype into production and after that, when G1G1 people can buy one? It would be great to have one (or a few) at XO User Group meetings as well as schools in developing world. my xo charger is broken and can i get a new free one. this laptop is broke kinda. going very slo. having problems.